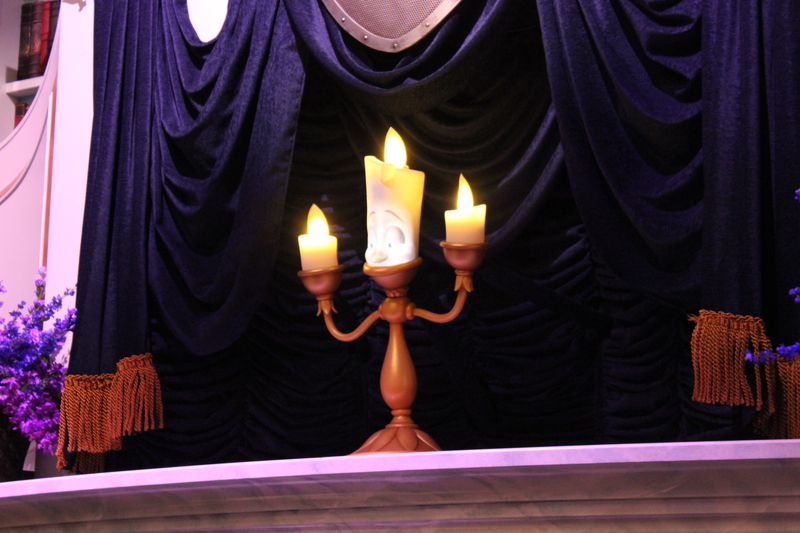 This multiscene Beauty and the Beast experience takes guests into Maurice’s workshop, through a magic mirror, and into Beast’s library, where the audience shares a story with Belle. 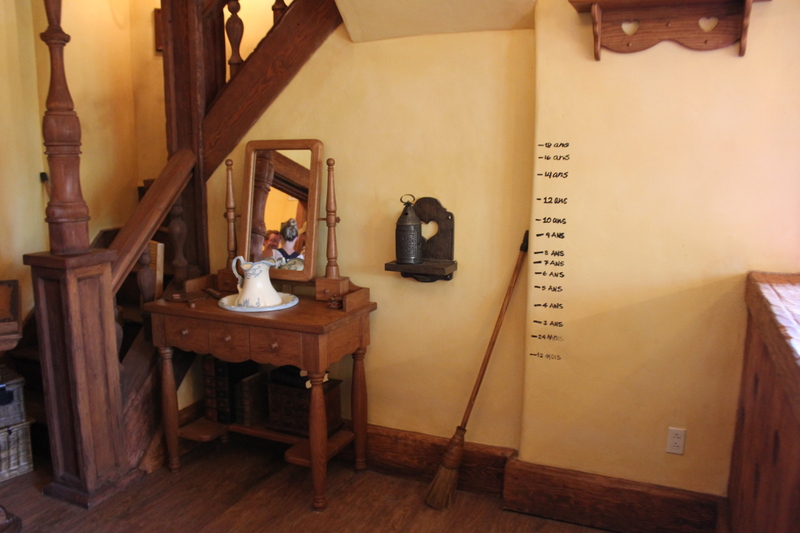 You enter the attraction by walking through Maurice’s cottage, where you see mementos tracing Belle’s childhood, including her favorite books, and lines drawn on one wall showing how fast Belle grew every year. From there you’ll enter Maurice’s workshop at the back of the cottage. An assortment of Maurice’s odd wood gadgets covers every inch of the floor, walls, and ceiling. Take a moment to peruse the gadgets, then focus your attention on the mirror on the wall to the left of the entry door. Soon enough, the room gets dark and the mirror begins to sparkle. 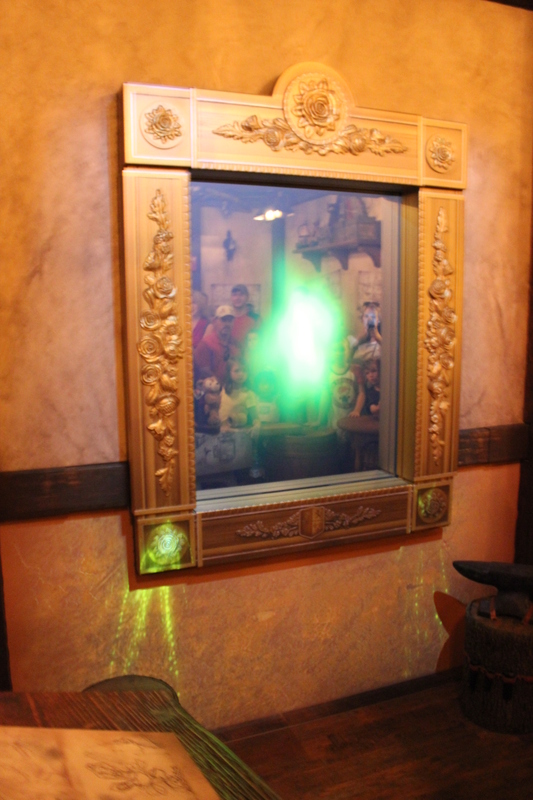 With magic and some really good carpentry skills, the mirror turns into a full-size doorway, through which guests enter into a wardrobe room. Once in the wardrobe room, the attraction’s premise is explained: You’re supposed to reenact the story of Beauty and the Beast for Belle on her birthday, and guests are chosen to act out key parts in the play. Once the parts are cast, everyone walks into the castle’s library and takes a seat. Cast members explain how the play will take place and introduce Belle, who gives a short speech about how thrilled she is for everyone to be there. The play is acted out within a few minutes, and all of the actors get a chance to take photos with Belle and receive a small bookmark as a memento. During our visits, only those who were chosen to act in the play got to take photos with Belle. Also, those who took photos with Belle received a separate Memory Maker card for those photos. Enchanted Tales with Belle is surely the prettiest and most elaborate meet-and-greet station in Walt Disney World. 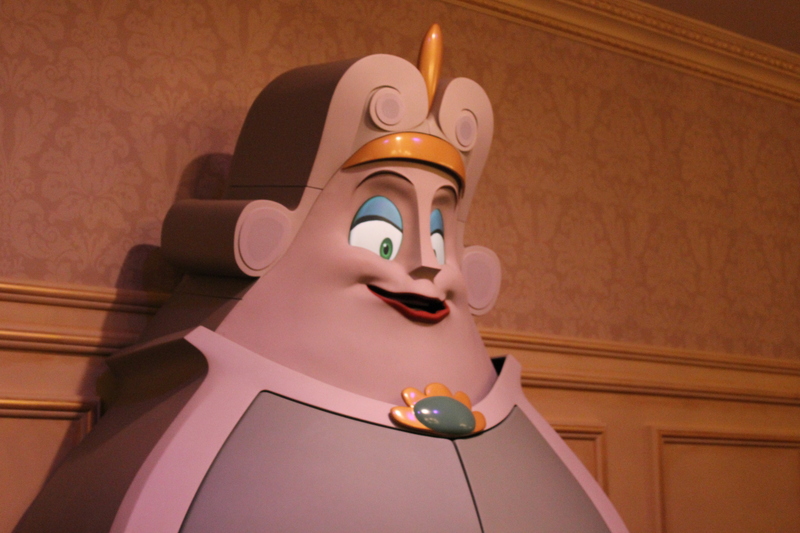 For the relative few who get to act in the play, it’s also a chance to interact with Belle in a way that isn’t possible in other character encounters. We also like how Disney “stages” guests in the cottage, workshop, and wardrobe rooms—it’s a relatively efficient way to handle the wait in line, and it keeps guests from getting bored. Sure, it can still be a 30-minute wait for a 3-minute play, but it’s the best of its kind in Orlando, and your kids will love it. Enchanted Tales has long lines from about an hour after the park opens. Its popularity and low capacity can make the lines long a slow moving all day. This chart shows you roughly how long you'll wait for Enchanted Tales with Belle when you visit on a day with a given Magic Kingdom Crowd Level. The blue bars represent the average "peak" wait time (that is, how long the line will be at its busiest). The bottom and top black lines represent the range of peak wait times to expect (for you fellow nerds out there: it's the 5th percentile and 95th percentile of peak wait times). Please note that these are estimates, and for a better forecast for your travel dates, see Enchanted Tales with Belle Wait Times.